Material: Cotton and ceramic planter. The Color of the Cotton Rope: Creamy white. Ceramic flower pot: burlywood. Size: 18" Length when hung(from top to bottom), ceramic flower pot: Diameter 4 5/8" x Height 3 1/4"
This ceramic plant hanger paired with macrame has been made to care your mini green friends, like air plants, spider plants, succulents, herbs and ivies. You can plant your lovely plants directly inside the planter or use a little plastic pot. A pretty plant hanging near the window, ceiling, or in a tree, has always seemed so charming. Unique and wonderfully characterful hand built ceramic planters. With individual textures and funky features. It makes a really good present to you, to your house, or for anyone that you care about: it gives more character, life and warmth to the house and will live growing with the people. 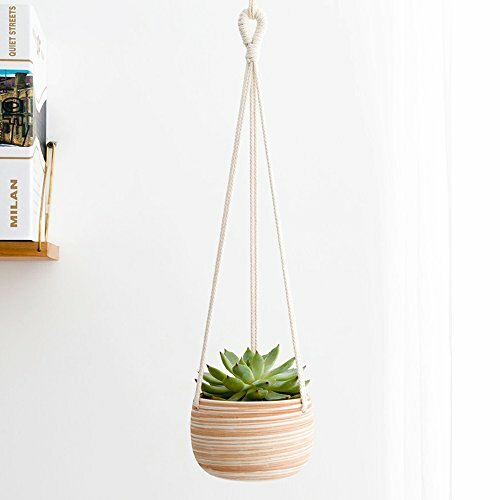 This ceramic hanging planter is a perfect way to add a touch of greenery to your space. Make it your own by adding all your baby plants, succulents, cactus, herbs and ivies. No plant in this item! Material: Cotton rope with ceramic planter. Beautiful and functional. Suit for indoor or outdoor use. Drainage holes are available for outdoor use, allows water to flow through the soil so your plant stays healthy. The outside of the planter is left unglazed with burlywood textures, interior is bare clay, this creates an interesting visual contrast between the unglazed and the natural texture of the clay. Hang it in a roof, patio, shelf, or nook of your house creating an confortable ambient. Great for giving this to somebody as a birthday present, also good as a wedding or housewarming gift. The Size of macrame ceramic plant hanger: Length 18", ceramic flower pot: Diameter 4 5/8" x Height 3 1/4". Mkono is a registered trademark and our product is professional manufacturing and sole selling.